Ileni was once hailed as the most powerful young sorceress in generations. Now, she is losing her power day by day, minute by minute. Since she is useless as a magical trainee, the Elders have sent her off on one last mission, to the caves of the assassins. There she will try to hoard the last of her magic, fulfill an ancient bargain, and investigate the deaths of her two predecessors, who died under mysterious circumstances. The fate of her world may rest on what she finds in those caves – if she doesn’t die first. Among Ileni’s people, the Renegai, some magical power fades before adulthood and some stays forever. Everyone is Tested early, and those who have lifelong power are trained to use their magic. Ileni’s magic was supposed to be the lasting kind, but it is leaching away from her with every spell. This set-up (where someone loses their power instead of discovering it) is very interesting. The coping mechanisms that Ileni employs and the morass of her dark thoughts are extremely convincing. Ileni is entering the realm of death (what else would you call a school for assassins? ), but she also mourns her power so much that she lives as if she has a death wish. Ileni's not a light or funny character, and she says and does some things that are less than likeable, but she’s real. Cypess hits her notes of despair, desperation and fearlessness perfectly. Sorin is Ileni's match. He's the young assassin assigned to guard and guide Ileni through her transition. He’s been chosen for that role (and survived the caves at all!) because he's intensely loyal to the Master, and lives for his missions and to fulfill his training, even if it means his death. When he and Ileni interact, there are sparks – but the kind that come from rock striking rock. Little by little the two come to understand more about each other, but trust is in short supply in the caves, and it is not fed by the intrigue and death all around. Of course, a story like this wouldn’t be complete without a twisty plot. It revolves around the Master of assassins and the world outside the cave, which is split between the Empire (evil) and the non-Empire (ambiguous). Although I enjoyed the story, I only experienced one true surprise. 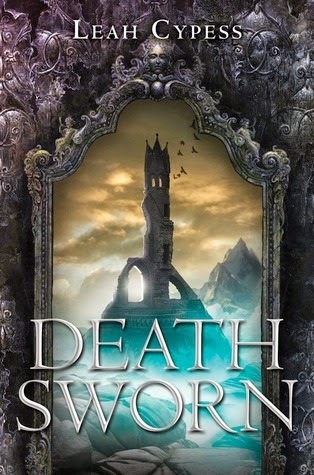 That said, Death Sworn is an effortless read, and it was fun to see some ‘usual’ fantasy tropes turned on their heads. Although there was a Sorin/Ileni dynamic I wouldn’t call it a romance (because it’s quite dark). All in all, Death Sworn was a quick and enjoyable read. Recommended for: fans of Kristen Cashore’s Graceling, and anyone intrigued (as I was) by the concept of a sorceress exiled to certain death in a school for assassins.